In this field the integration of GIS and Remote Sensing with other specific technologies and techniques enables organizations to forecast and monitoring of natural or anthropic phenomena related to sea waters, coasts and sea species. Coastal zones are matter of several studies, that have the purpose of individuating tools and methods for their monitoring and management. Remote sensing is a very effective tool to check the quality of waters periodically, allowing to identify possible risk in short times. 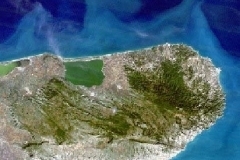 Planetek Italia uses different techniques to control and forecast the development of natural phenomena, such as the processing of satellite images, the use of mathematical simulation models, sea truth data and satellite tags. The integration of these techniques within GIS allows to produce sea temperature maps, sea color maps, maps of spatial distribution of the sea species and thematic maps of the seasonal cycle of microorganisms (based on temperature, sun light, currents and presence of polluting species). The results of this processing could be made available with the support of the telecommunication networks, allowing the development of real time services.